Where to Eat in Weybridge? | Curchod & Co.
Where to Eat in Weybridge? If you are looking for unique eateries, then you can find several independent restaurants along Baker Street, which include a Spanish tapas bar. Moreover, some traditional Italian restaurants such as Osso Buco can also be found on Church Street. Read on for a list of a small selection of what Weybridge has to offer on the gastronomic front. If regional cuisine and wines are what you are seeking, then Osso Buco is guaranteed to offer an authentic experience with much of the menu featuring core ingredients which are sourced directly from Italy. This family run restaurant offers a friendly service along with a relaxed ambience that provides the perfect setting for some after-work cocktails or alternatively a special meal with a loved one. Prices start from £10.95 for a classic Italian lasagne and gluten-free options are also available upon request along with a bambini menu for the little ones. Hugely popular with the locals, The Minnow pub provides the perfect place to relax should you wish to escape the hustle and bustle of everyday life. With menus designed to suit everyone’s taste, a selection of real ales, lagers and wines and gardens that overlook the river on Thames Street it is hardly surprising that it is such a hit with the nearby community. If you are seeking a memorable location for lunch with a business client, then The Oatlands Chaser ticks all of the boxes. As well as a newly refurbished pub and gorgeous interiors, The Oatlands Chaser also provides accommodation for those visiting the area from further afield, making it the ideal place for those attending business meetings. If it is al fresco dinning that you fancy, then don’t forget to pay a visit to the outdoor space for some drinks or a light bite to eat in the sunshine. 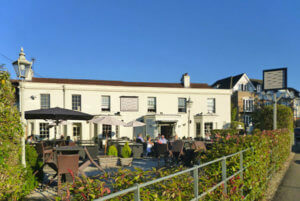 Prices start from £12.50 for a two courses on their fixed lunch menu or £15.50 for three courses. Alternatively, if you want to impress a client, then perhaps a steak might go down well at just £20.95. This Nepalese restaurant offers service with a smile, attentive staff, a delicious range of dishes which include set meals from as little as £26 for two people and prices that won’t break the bank. This award-winning restaurant offers 1930’s style decor, exceptional service and a touch of glamour. In addition to its fine selection of wines, the 1907 restaurant and grill provides fresh seasonal produce with menus created by their talented chefs. Moreover, the two rosette AA stars along with a name which was inspired by the year that the world famous Brooklands racetrack was launched, clearly demonstrate exactly why it draws many individuals. Prefer something more mainstream? Weybridge also offers a choice of chain restaurants which include the Côte Brasserie, Pizza Express, Prezzo, Café Rouge and many more.